Your attention please….we interrupt your 'blah' day for an important announcement that will break the monotony and give your day a much-needed jolt of energy! All eyes, all ears, make way for the Disrupt Festival! 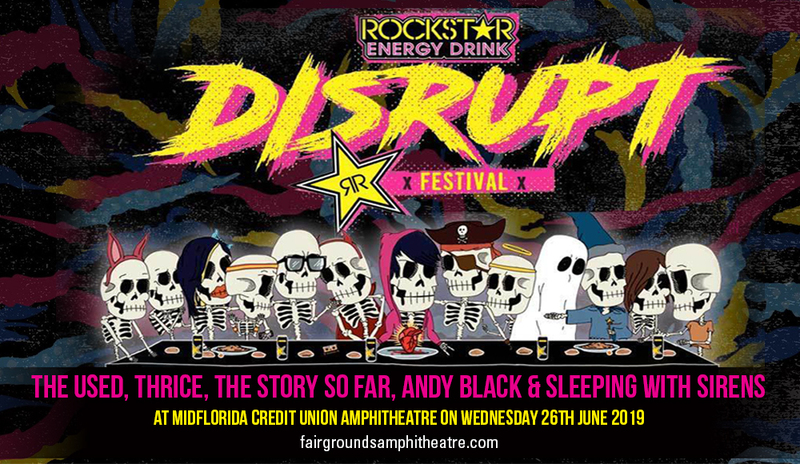 Save the date, pin the venue, and tag your friends: The Rockstar Energy Drink Disrupt Festival, is happening at the MidFlorida Credit Union Amphitheatre on Wednesday 26th June 2019. A sneak peek of the line-up: The Used, Thrice, The Story So Far, Andy Black & Sleeping With Sirens, and more! The countdown has begun. The order of the day is to book your tickets a.s.a.p. ! With just a few easy clicks starting off with the 'buy tickets' button on this website, you'll be well on your way to one of the biggest and hottest summer slamming festivals this season. Don't miss it! 25 cities across North America will be roused from lethargy and will wake-up to bustling with energy! Yes, as dates to the Disrupt Festival were dropped and shouted out on social media, eyes and ears are now wide open with eager anticipation. Rockstar Energy Drink is the brand behind such music festival experience that brings together the biggest rock luminaries as well as the rising stars that will explode on stage. What are you waiting for? Drop everything and get your tickets now!